Microfluidics, nanofluidics, and lab-on-a-chip are among the most rapidly growing fields of scientific research and technology development. In order to meet the needs of research and technology development and to provide a single reference resource with updated reviews and overviews of various directions of microfluidics, nanofluidics, and lab-on-a-chip, the first edition of the Encyclopedia of Microfluidics and Nanofluidics was published in 2008. This first edition has been considered as a most valuable reference and highly appreciated by the community over the past several years. In order to keep the information up to date and to add coverage to newly developing areas, we are very pleased to present to you the second edition of the Encyclopedia. This new edition of the Encyclopedia includes the updated entries of the first edition that cover leading-edge research. 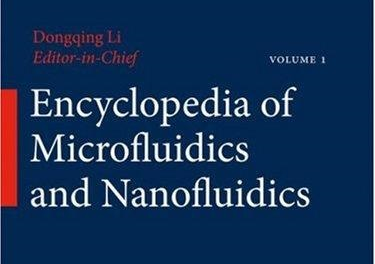 Furthermore, this new edition of the Encyclopedia includes over 80 new entries to cover new topics in microfluidics, nanofluidics, and lab-on-chip technology, for example, energy conversion and material synthesis using micro-/nanofluidics, and microfluidic chips made of paper and fabric. The entries are organized around four types – fundamentals, theoretical models and numerical simulations, experimental techniques, and applications and devices. These carefully selected contributions are written by well-known experts in microfluidics and nanofluidics and are reviewed by the editorial board and section editors consisting of internationally leading scientists in these fields. I would like to thank and congratulate all the contributing authors. Through this Encyclopedia, you have made a great contribution to these fields. I would like to give my sincere thanks to all the section editors for reviewing and editing so many manuscripts to ensure the highest quality. Finally, my great appreciation goes to the colleagues at Springer, Lydia Mueller, Sunali Mull, and Audrey Wong; their persistent efforts and hard work ensured the completion of this Encyclopedia. For information can be found on this document Encyclopedia Front Matter and the link on Springer.